With the violin as a starting point, Mandhira de Saram dived into a career of investigation. It started with classical music; it’s ended down a rabbit hole. She studied music in Sri Lanka, then North London, and finally graduated in performance at the University of Oxford – she was walking a path of classical music and chamber bands, but emerged from it interested in improvisation and extended techniques. A sense of musical egalitarianism flows through her work – as if she sees equal value in the most diametrically opposed sounds. Rather than siphon off these myriad styles, de Saram has often decided to balance them, crafting performances both solo and for ensemble that reflect different ideas and dynamics. The scope of her performances is immense: audiences are just as likely to hear de Saram flex on a 20th century piece as they are to hear an out-and-out jazz skronking. An appearance at Emulsion Festival was described by Jazz Mann as that of ‘a classically trained musician improvising with the skill and fearlessness of a seasoned free jazzer’. The mistake lies in thinking this all makes de Saram a polymath. Instead of ticking each musical form off, one by one, she brings these worlds together, balancing beyond reason and expectation. In collaboration, de Saram embodies this fearlessness. Each partnership is a divergence, an opportunity to be wilfully displaced. She described the results of her collaboration with pianist Benoît Delbecq to the Sampler as ‘very different to a lot of music that I play’, considering its crystalline sound, fractious structure, and non-existent tempo to be at odds with her typical repertoire. She comprises one half of a violin and piano duo with Steve Beresford, a forbearer of Britain’s ever-flourishing improvisation scene, the duo performing with the kind of curious abandon his work typifies. Her partnership with Beresford came out of her time at London’s Strange Umbrellas, a music night for improvised music that she regulars. It’s a space in which de Saram says she can be ‘thrown in’ to performance, shirking the prepare-and-rehearse responsibilities of a classical concert. At the night, de Saram has performed with legendary artists such as vocalist Maggie Nichols, for a performance that sounded both spontaneous and symbiotic. Recently, de Saram has been making progressive waves in the contemporary music scene. In 2010, she formed the Ligeti Quartet, enlisting violinist Patrick Dawkins, cellist Val Welbanks and viola player Richard Jones. It’s a project that reveres – but also transforms – the string quartet. She has honed the collaborative ideas and experiments she trialled in her university group, Ensemble ISIS, as well as with her piano trio TableMusic. 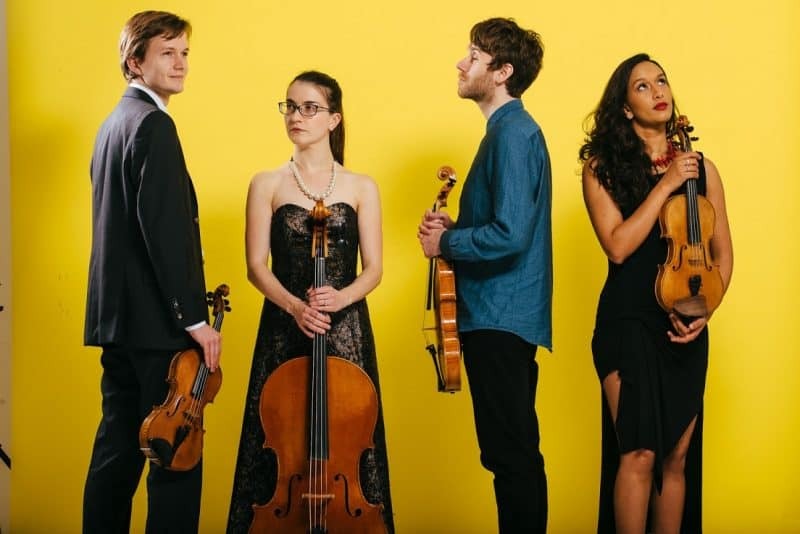 As with TableMusic – where de Saram often plays her secondary instrument, attempting to ‘break new ground’ in the sphere of performed music – the Ligeti Quartet is anything but a comfort zone. From their off, the quartet went big. 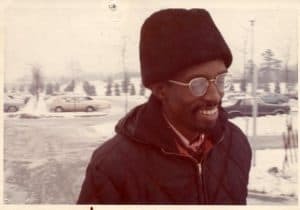 An early undertaking for the group was Wadada Leo Smith’s Ten Freedom Summers, a thirty-year long endeavour that’s part contemporary opus, part free jazz essay on America’s civil rights movement. The quartet was part of the group responsible for bringing Smith’s work to London’s Café Oto in 2013. It was an immediate deep end to be thrown in at; the piece’s density and detail required sensitive, learned musicians who could also help reimagine the piece, rendering its maximalist properties in a way that suited the environment. Their relationship with Smith has blossomed, and the quartet continue to work with him on a series of pieces for string quartet. A closer look reveals that Smith and de Saram, who continued to perform as a duo together, share similar philosophies when it comes to the string quartet; they both approach it with curiosity and imagination. Smith has talked of his interest in taking the European tradition of string quartets and localising it to his experience growing up in Mississippi. Meanwhile, de Saram has spoken of the string quartet as a historical vessel with modern purpose: ‘historically it is a very important medium’, she told the Sampler, while noting its vital use in today’s music landscape, for ‘twenty-first century music, collaboration and experimentation’. 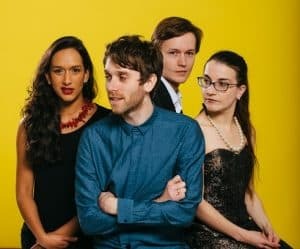 For their hcmf// concert, the Ligeti Quartet perform a piece from Stef Conner, commissioned by the RVW trust, in which she distills the essence of the string quartet in Singing Strings. It is a meta composition that is as much written about the string quartet as it is for it, an exposition of its history that also critiques its position and potential. Mandhira de Saram’s reverence for the string quartet is coupled with an interest in investigating and trespassing on its tradition, in collaborations with artists from outside the contemporary-classical framework – and even outside of music altogether. If their hand in Ten Freedom Summers signalled this, more recent work is proving it. Their performance at hcmf// includes an interpretation of Tanya Tagaq’s Sivunittinni, a piece from her 2016 record Retribution and initially part of the Kronos Quartet’s 50 for the Future project, a commissioning project begun in 2015. An Inuk throat-singer and political activist, Tagaq’s music came at a vital moment of reckoning in Canada’s treatment of its indigenous people. Transposed for a string quartet, reviewers have made note of ‘gritty’, full-throttle performances – de Saram’s quartet bringing vital confrontations to the fore of our concert experience. Ultimately, de Saram has created a direction for the quartet that is long-term and slow-releasing, focusing on significant relationships with composers. The quartet are currently working with Christian Mason to realise a series of ‘songbooks’ for quartet, each one honouring a different overtone singing tradition. It sounds unlikely, but Mason draws close parallels between vocal sound and string music. This is the kind of wayward realisation de Saram seems effortlessly capable of masterminding. It’s also in keeping with their mission statement, a commitment to bring contemporary music to ‘a diverse range’ of people. In part, they’re doing this by questioning the norms of concert curation itself. Theirs is a music that pushes far beyond the limits of what four people with string instruments are expected to do. As someone who’s never once settled down with one genre of music, Mandhira de Saram has become the innovator the string quartet needs. See Mandhira de Saram perform with the Ligeti Quartet at hcmf// 2018 on Saturday 24 November, 12pm, at St Paul’s Hall and in hcmf// mixtape, also on 24 November, 10pm at Bates Mill Blending Shed.